Power-Up your classroom with BYTES Power Smarts! 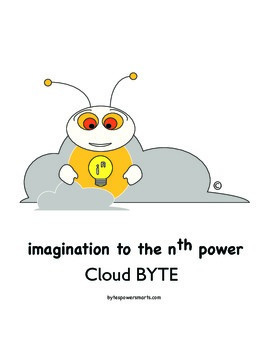 Character Poster #6 features Cloud BYTE, 8-Bit’s friend with strong Self and Word Power Smarts. Cloud BYTE is a thinker and loves to speak in puzzling, poetic rhymes. Read about all the BYTES characters in the FREE BYTES Power Smarts stories for elementary age children. Use these character posters to decorate your room or Literacy Center. BYTES Power Smarts stories are FREE and designed for elementary age children to help them learn about their multiple intelligences (Power Smarts®). By using their Power Smarts, students will improve their strengths and talents, thus building self-esteem and confidence. Power Smarts are based on the multiple intelligences identified by Harvard research psychologist Howard Gardner. BYTES Power Smarts stories use complex text and advanced vocabulary, encourage creative and critical thinking, and can be used to address Common Core Standards. Older children, parents, and grandparents will enjoy BYTES Power Smarts stories, and they can be read to younger children too! Each story comes with optional discussion questions to spark interesting conversations with family and friends while developing face-to-face conversational skills. BYTES Power Smarts uses original art for its instructional materials. We think your students will enjoy our unique characters. Learn more about the BYTES characters who live in the Info-verse at bytespowersmarts.com. By joining the BYTES email list, you will receive free Creativities for each story exclusively available via web sign-up. BYTES does not sell or share its email list. You can find BYTES Power Smarts on Facebook too! BYTES Power Smarts instructional materials are designed by Kathy Hackett and Theresa Jackson who have over 55 years of combined teaching experience in the areas of preschool education; elementary gifted and talented education; twice exceptional education; and deaf education; adult literacy; and undergraduate and graduate college education. Theresa and Kathy have received many outstanding educator awards including The Washington Post newspaper’s Agnes Meyer Outstanding Educator, Maryland State Department of Education Awards, and Time for Kids Excellence in Education, and both have coached first place state winning Odyssey of the Mind and Destination Imagination teams that have competed at the global level. See our profile page for more information about us. Power Smarts® and Choice Cards® are registered trademarks of inLightenment, Inc. As owners of inLightenment, Inc., we give you permission to use the terms Power Smarts® and Choice Cards® and to enlarge our instructional materials for use in your classroom as long as you do not sell or share these items. Page Size: Actual Size; Orientation: Auto Portrait/Landscape; Page Set Up: Borderless 8.5 X 11"; Scale: 100%. To save ink, try one page to be sure it prints the borders before printing the entire packet as you might have to make printer setting adjustments. Please go to your My Purchases page (you may need to login). Beside each purchase, you'll see a Provide Feedback button. Click it, and you will be taken to a page where you can give a quick rating and leave a short comment for the product. We value your feedback as it helps us determine which products are most valuable for you so we can create products that you need. On the right side of any product page, click on the star in the Made by BYTES Power Smarts box. Lead with your Power Smarts!